It was early in the morning around 4 am, i awoke to go to the bathroom which caused me to be awake enough to go onn the porch to smoke a cigarette. i put on my coat as it was february. it was so quiet and desolate at the time. as soon as i walked out i saw an orb of light just coming out from the obscurity of the tree in front of the house. for a second or two i felt it was scanning the street. i mean that was the first thought in my mind when i saw it. i was thinking to myself (what was it doing?) it was traveling a foot or two away from the power lines while slowly cruising along their path down the street. as soon as i asked myself what that was and what it was doing; it seemed to have noticed me and it's slow scanning pace sped up faster then the speed of light. it continued straight then went up down about three times and then just disappeared. the shape upon it's exit was like perfect geometrical triangle formation. sort of like this ___<<< only the triangles were open end down. i was in awe of what i saw and smoked a couple of cigarettes, while i was trying to get a grip of what i witnessed. i never really had much to say about orbs type stories. i know of a few stories of orbs in living rooms etc..... i never thought i would have experienced something like this. then a few months ago at the same place on the porch; my sister and i were sitting on the porch. we have a great view of the stars, moon, anything in the sky. we are looking over a very busy airport and military base. so we see often commercial jets, military planes, helicopters etc... so this night i asked my sister to look in the sky and see if she was seeing what i was seeing. i pointed to an object lit up with red and green lights pulsating. it was moving back and forth some. it never traveled straight like a jet, seemed to high to be a helicopter, it just hovered there for more then 30 minutes before we got lost in conversation. i guess this is a very active area. these are my stories. i saw a ufo in kingston nh at the age of nine. never experienced anything like that again until 50. 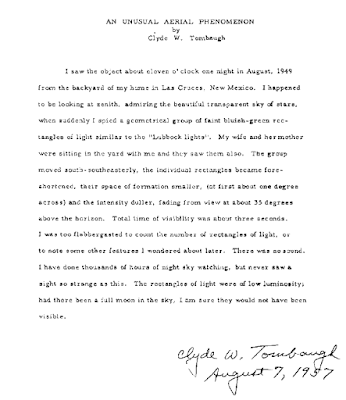 Editor's Note: Clyde William Tombaugh was an American astronomer. He discovered Pluto in 1930, the first object to be discovered in what would later be identified as the Kuiper belt. transparent sky of stars, when suddenly I spied a geometrical group of faint bluish-green rectangles of light similar to the "Lubbock Lights." My wife and her mother were sitting in the yard with me and they saw them also. The group moved south-southeasterly, the individual rectangles became fore-shortened, their space of information smaller, (at first about one degree across) and the intensity duller, fading from view at about 35 degrees above the horizon. Total time of visibility was about three seconds. I was too flabbergasted to count the number of rectangles of light, or to note some other features I wondered about later. There was no sound. I have done thousands of hours of night sky watching, but never saw a sight so strange as this. The rectangles of light were of low luminosity; had there been a full moon in the sky, I am sure they would not have been visible. 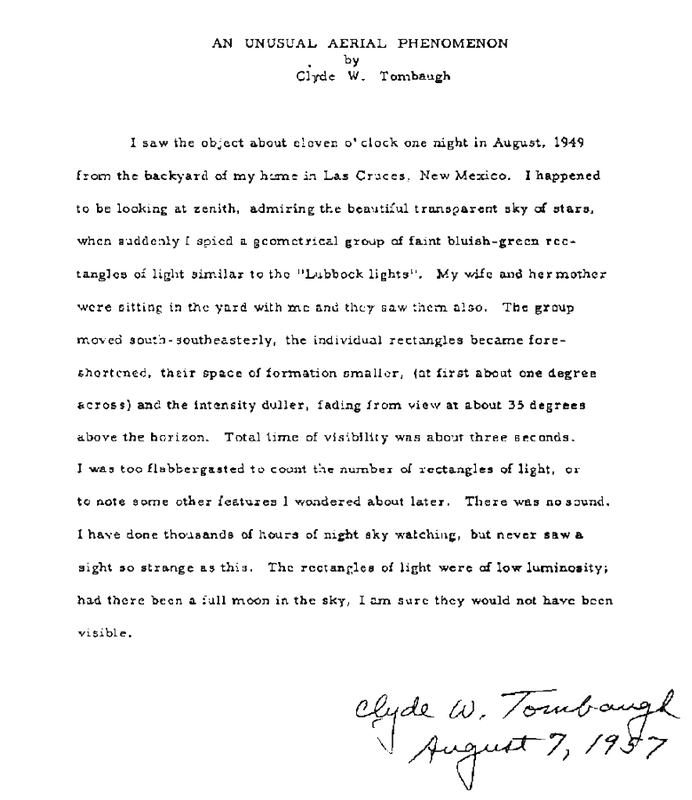 Witness To Tremonton UFOs Still Alive!